↑ 5,0 5,1 Frost, Deborah. Taking The Cure With Robert // Creem Magazine. - 1987. - October 1. ↑ Blashill, Pat Just Like Hell // Spin. — март 2000. — В. 3. — Т. 16. — С. 100-106. — ISSN 0886-3032. ↑ Hull, Robot A. The Cure: …Happily Ever After // Creem. - 1982. - January. ↑ Thrills, Adrian. Ain’t No Blues for the Summertime Cure // NME. - 1978. - December 16. ↑ 14,0 14,1 14,2 Sweeting, Adam. «The Cure - Curiouser and Curiouser». Spin. July 1987. ↑ Kent, Nick. Seventeen Seconds review // NME. 1980. - April 26. ↑ Gosse, Van. The Cure Play It Pure // Village Voice. - 1980. - April 21. ↑ Morley, Paul. Days of Wine and Poses // NME. - 1980. - July 12. ↑ Reynolds, Simon. Rip It Up and Start Again: Postpunk 1978-1984. - Penguin, 2005. - P. 358. - ISBN 0-14-303672-6. ↑ Sutherland, Steve. The Incurables // Melody Maker. - 1982. - December 18. ↑ Kent, Nick. The Top review // Melody Maker. - 1984. - May 5. ↑ Sutherland, Steve. A Suitable Case for Treatment // Melody Maker. - 1985. - August 17. ↑ Apter, 2006, էջ xii-xiii. ↑ «Gold & Platinum: Searchable Database»։ Recording Industry Association of America։ Արխիվացված օրիգինալից-ից 2011-01-28-ին։ Վերցված է 2008-09-19 Note: User needs to enter «The Cure» as a search term for the Artist. ↑ Witter, Simon. The Cure: The Art of Falling Apart // Sky. - 1989. - June. ↑ 74,0 74,1 Sandall, R. Caught In The Act // Q. — Май 1989. ↑ Greenwald, Andy The Cure - The Head on the Door // Spin. — 2005. — В. 12. — Т. 21. ↑ Collins, Andrew. The Mansion Family // NME. — 18 апреля 1992. Apter, Jeff. 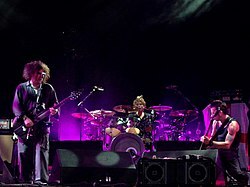 Never Enough: The Story of the Cure (անգլ.). — Omnibus Press, 2006. — ISBN 1-84449-827-1. Barbarian, Steve Sutherland L; Smith, Robert. Ten Imaginary Years (անգլ.). — Zomba Books, 1988. — ISBN 0-946391-87-4. Bétrisey, Jean-Christophe; Fargier, David, One Hundred Songs The Dark Side Of The Mood (ֆր.)(անգլ.). — Editions du Tricorne, 2007. Jeremy Wulc : My dream comes true : Carnet de route avec The Cure (ֆր.). — Camion Blanc, 2009. Hopkins, S.; Smith, Robert; Foo, T. The Cure: A Visual Documentary (անգլ.). — Omnibus Press, 1988. — ISBN 0-7119-1387-0. Thompson, Dave. 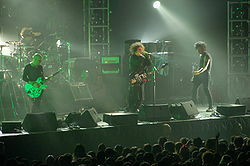 In Between Days: An Armchair Guide To The Cure (անգլ.). — Helter Skelter Publishing, 2005. — ISBN 1-905139-00-4. Thompson, Dave; Greene, Jo-Ann. The Cure: A Visual Documentary (անգլ.). — Omnibus Press, 1988. — ISBN 0-7119-1387-0.